It’s been a while since I wrote a travel post, you guys! Okay so that’s probably because I have mainly traveled for work the past couple of years. 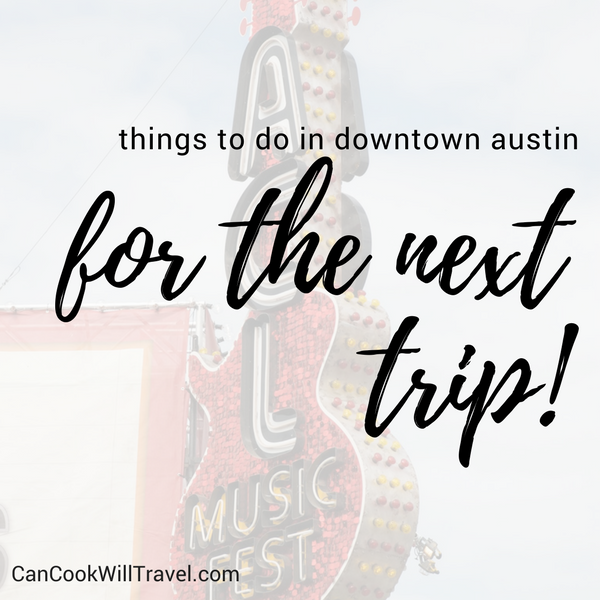 But two weeks ago I extended a work trip for a little fun, and so I’m sharing some things to do in Downtown Austin. Totally spur of the moment work took me to Austin, and I gotta say I kinda resisted it at first. The meetings could have come to me in KC, but my boyfriend was excited about a little trip out of town. And knowing that he was up for the trip made me excited about it too. So we scrambled to get flights and a hotel booked, and off we went the next day. Easily that is the fastest I’ve ever packed up for a trip out of town, and it was kinda exhilarating. It’s amazing how much you can get done when you HAVE to. 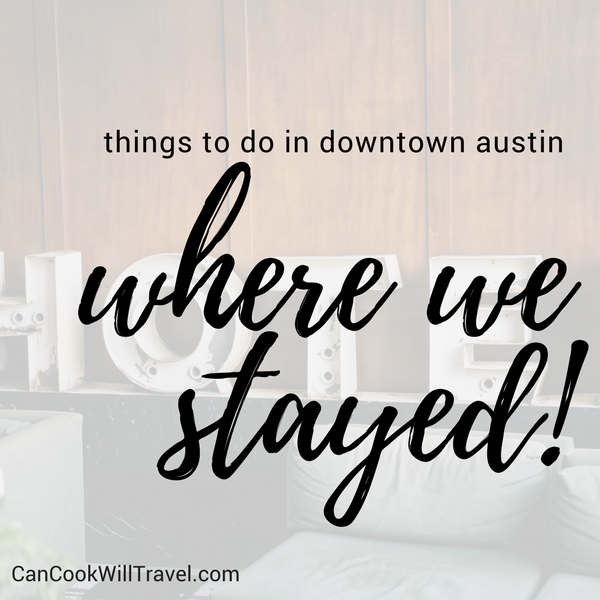 And having never been to the city before, I had no clue about things to do in Downtown Austin, which was where we were headed. My appointments were at a building Downtown, so my goal was to get us somewhere pretty close since I had no time to research transportation. Plus since my guy would be on his own for at least a day and a half while I was in meetings, I wanted us to be somewhere walkable. Booking a hotel last minute isn’t exactly inexpensive, and with half the trip being out of my pocket, I didn’t want to spend a fortune. So I came across this great spot called The Locale, which lets you stay in an apartment instead of a hotel. Gotta say that this concept was a new one to me, so I was pretty curious. The reviews were great though, so that helped sell me a bit more. (Which reminds me I definitely need to leave a review!) And with limited time and this spot being the cheapest rate I could find and crazy close to work, I went for it. No keys – You can self check in and check out, which is really awesome! No front desk, so it makes you feel like you’re living there a bit. The apartment has a cool loft-like industrial vibe with concrete everywhere and tall ceilings. Modern furniture and decor fit my style and felt really comfy. Great TV setup – I’m pretty sure my new favorite tech is the Roku TV after this trip! Working kitchen, so if we wanted to cook something like pizza or takeout, we easily could. 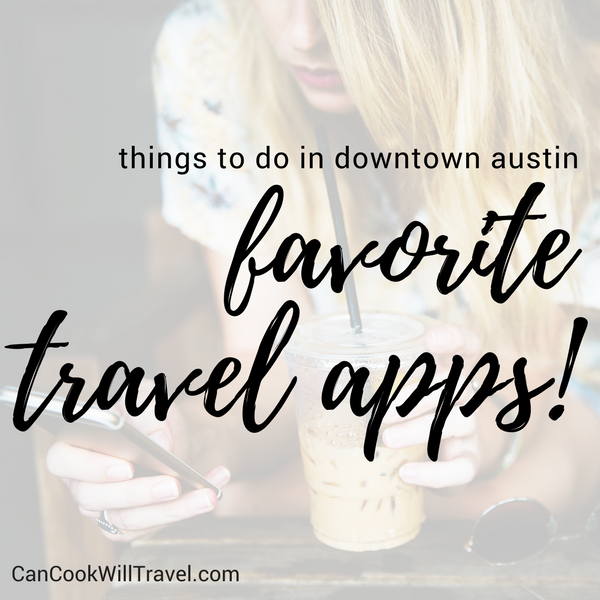 Those are just a few things that the Locale offered, along with a book on their picks for things to do in Downtown Austin. It was so great for me to leave my fella and come back after work and feel like it was more of a home. Downtown Austin comes ALIVE at night, and we heard every peep of it, so just bring some earplugs and life is grand. Clearly food is the most important decision of my day, because that’s how foodies operate. 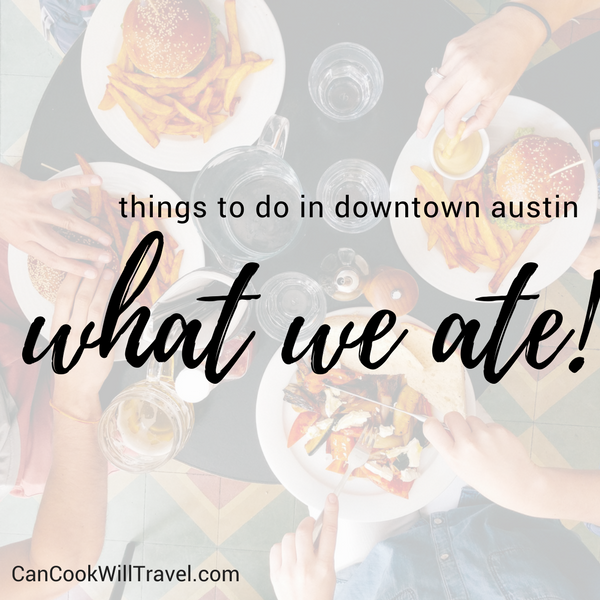 So what to eat was my biggest concern when it came to things to do in Downtown Austin. I didn’t do breakfast too much, just because I was either trying to sleep in or going nonstop. But I did grab something one morning at the grocery store right by where we stayed. That store came in handy and showcased great local foods and a decent variety considering the small size. Swift’s Attic – What a cool spot with this upstairs restaurant. Loved the burger, the vibe, and the music all provided great ambiance. I definitely recommend this stop! Cooper’s Old Time Pit Bar-B-Que – We didn’t really know what to expect when we found the place but had heard it was good food. But it was a really casual spot where you can walk through a line and pick out your food. It’s like a manly, BBQ version of a cool cafeteria, now that I think about it. We shared a huge beef rib and some spicy jalapeño mac ’n cheese, which was plenty for me. I like the idea of sharing though, because it’s the perfect amount when you’re hungry but don’t want to overdo it. Manuel’s – My final time to dine out that was work related was this great Mexican restaurant. It’s no hole-in-the-wall spot, and has a slightly fancy feel to it. I ordered the spinach enchiladas with verde sauce, which I loved. But I was even more a fan of the rice, because it’s not the traditional Spanish rice you get. Rather the dish consists of a white rice served with big pieces of fajita-style bell peppers. It was light yet filling – yum! Fadó Irish Pub – So when I got back from Manuel’s my boyfriend hadn’t eaten yet. I found myself chock full of Mexican food, but we landed here, and I felt sad that I’d already eaten. His pub burger with fried egg looked insane along with seriously great thick-cut chips. We kinda fell in love with the St. Barnabas Christmas Ale on tap, and ended up staying there for several hours. This place looks like a combination of so many different pubs in the UK that I’ve frequented, and I just loved it. So we may have gone back there the next day for an afternoon snack of more chips and an enormous and insanely good soft pretzel (and more beer). And then it was also our final stop for lunch before heading to the airport. I finally got to check out the pub burger myself on that trip, and it was so worth the wait. Holy smokes, it’s easy to see why we came back to this bar 3 days straight. Hey, if you know what you like, then why not enjoy it?! Chinatown – We wanted a different kind of cuisine and Asian won. After doing some research, we settled on Chinatown and my stomach was so happy. They have a great egg drop soup, which is always my first test of a Chinese restaurant. And our spicy dinners overflowed with jalapeño slices, which marks a first for me in my Chinese entrées, and that Hunan Beef tasted crazy good! I still want to go explore 6th street more. We walked around there on Friday and there were so many cool bars and restaurants that we could have hit if we had time. 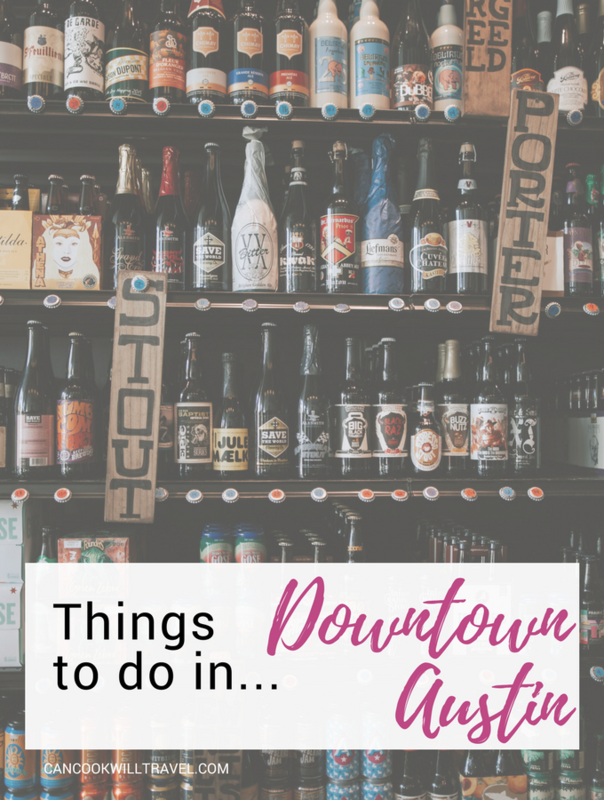 And if you’re looking for things to do in Downtown Austin in relation to pizza, then there are a ton of options on this street to check out too. Walking around Downtown the art lover in me was digging the gorgeous wall art all over the city. So I’d love to go back and soak more of that up as well. We planned to catch a show Friday night but the long day wiped us out, so next time live music must happen! I also heard walking down to the lake is a great spot to hit when it comes to things to do in Downtown Austin. Located right by Downtown and looking pretty lovely, makes for an easy walk and a great reason to visit the lake. Lyft – I hadn’t ever used a ride share app myself, because I’d always been with someone who set it up. But this trip I gave Lyft a shot, and it worked out great! In fact, our last Lyft driver was at our pickup spot before we could get out of our seats. Of course who drives you is out of your control, but the app is slick and easy to use. TripIt – Okay usually I use TripIt to organize my travel, but this trip happened so fast I forgot to use it. However it’s an awesome app to use especially to share out your itinerary with your family and friends! Yelp – When we needed to narrow down places, this app came in super handy. It’s so easy to compare ratings, reviews, and even check out pictures of the food. The Parking Spot – I always park here at the airport, so if your airport has one, then check it out. Getting to your car is easy, the drivers are great, and I trust my car is in good hands there. Google Maps – A good map app is a must when traveling, and I think it doesn’t get much easier than Google Maps. We used it to plot where we wanted to go, because it would estimate times and offer multiple routes. 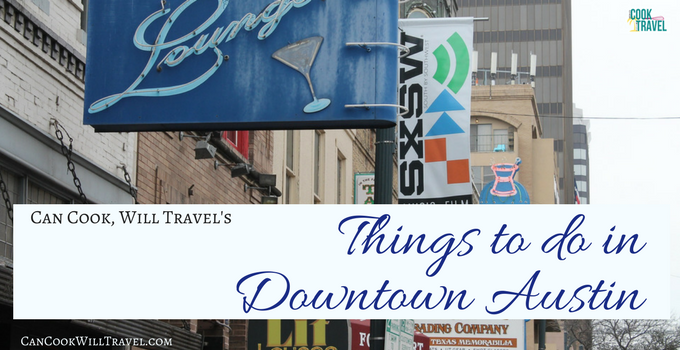 I’ve covered a lot for you in this Things to Do in Downtown Austin post. From where we stayed, ate, travel tips, and more for my next visit, there’s tons of great info for you. Definitely the Irish pub topped my list of favorite spots to eat, but the food tasted fabulous everywhere we tried. So for my next trip, I’m taking Austin recommendations! What are your favorite things to do in Downtown Austin? Comment below, and then we can chat about it more! Stay inspired & say yes to impromptu trips!